The signs were good from the start. 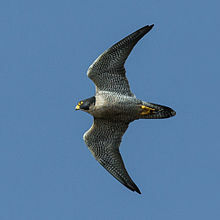 As I stood at the kitchen window, waiting for the kettle boil, I saw a peregrine falcon soar over the roof. They are resident here, though not often seen. A quick check in the bird book confirmed it – closely-barred white underside with yellow feet, yellow bill and eyes. Quite distinctive. In the afternoon, I saw a greenfinch. A first for me. A finchy beak, green back and flashes of yellow on the tail and flight feathers. Very pretty. Then to cap it all, D saw a female oriole. A new arrival. At first we confused these with green woodpeckers although the oriole doesn’t have the yellow bottom of the woodpecker. It’s easier to be sure when you see a pair of orioles flying together, the yellow male and the green female. But this was definitely an oriole, identifiable by its song which the bird book describes as wee-dl-eyo. This entry was posted in Nature and tagged Andalucia, birds in spain, birds of prey, Sandra Danby, Spain, spanish finca on May 16, 2013 by sandradan1.